Over the past two days I've shared a few stories of times when I consciously went against my nature and decided to talk to strangers. Here is another such story (after this I'll shut up about my personality and find something better to talk about). On Tuesday as I went to the FedEx location on S.R. 23 in South Bend to return some rental gear to LensRentals¹ I noticed a man standing out in front of his green Volvo 240 wagon with the hood up, talking with one of the guys from the AutoZone in the strip mall. I've been a fan of 240's for a while now and I thought about going over to say hi, but I decided instead to just take my packages in and drop them off at the Pack & Ship counter. "Maybe if they're still out there when I come out of FedEx," I thought, "maybe then I'll say hi." Well, they weren't there when I came out of FedEx - in fact they were heading in to AutoZone. I decided to drive over next to the 240 just to take a look at the vehicle since, as mentioned, I am a fan of 240's. I found myself getting out of my car and walking into AutoZone. The guy who presumably owned the 240 was just checking out, having purchased a battery terminal cleaning brush. I intercepted him on the way out of the store. "Are you the guy with the 240 out there?" He affirmed that he was indeed that guy. I mumbled something back about how that was cool and how I noticed it because I had a Volvo too. "It was a real nice car until a deer met the front end of it," he mentioned. I agreed that this sort of thing is liable to mess a car up. "So what's going on with it?" I asked, unintentionally (but probably beneficially) using my most helpful OIT Help Desk tone.³ He told me that it was having trouble starting, that he noticed one of the wires going to the starter was frayed down to a thread, that he and a friend of his had hooked up a wire that ran from the starter up to the battery handle, so he could put the key in and then come up front and touch the wire to the battery and get it to start. I told him about Matthew's Volvo Site and how its forums were full of friendly and helpful Volvo lovers from all across the country and even around the world. He asked where the guy was from. I wasn't sure. Colorado, maybe? He told me about his son, who works for Delphi, and about how they work on projects for all kinds of cars including Volvo, and how someone at Volvo flew him out to the factory in... where is it? It's over on the Southwest side, near Denmark. "Gothenburg, maybe?" That sounded right. He kept fiddling under the hood with the wires that now held it in place, twisting them around and around. "Somebody from my church gave me this car, it just keeps going." I asked how many miles it had on it (this is a great conversational starting point for anybody with an old Volvo. We love to know how many miles are on it). He said, "That's a funny thing. The odometer stopped working! It said 129,000 when I got it but who knows how long it's been broke. It's probably a lot more than that now." He mentioned that he was originally from West Lafayette but that he came up here to work construction at Notre Dame. I assumed he meant the Campus Crossroads Project, temporarily forgetting about the thousand other construction projects ND currently has going. I mentioned that I worked in the building next to the stadium and that I sometimes go up and look out the 2nd or 3rd floor windows to watch the construction progress. "Oh, I've got a niece, er, uh... a niece that works at Notre Dame. Her husband works there too." Cool. "Do you know any Colombians?" Uh.... I guess not? No, I don't think so. "Oh. They're both Colombian, she and her husband. They work in, uh.... I guess it's north of the stadium. Are you north of the stadium?" "No," I said, "I'm on the west side there, in the classroom building." At some point the conversation sort of trailed off. I wished him good luck with the car and he said thanks, and then I did another weird thing that sometimes happens because I don't know how to end conversations. I stuck my hand out. "Peter." I'm really bad at remembering to say things like "My name is Peter, by the way." I just get stage fright and remember that it's polite to introduce myself but forget to say the other words and just sort of yell my name at whoever I've just met while attempting to shake their hand. Anyway, what I am saying is that I had a perfectly pleasant conversation with a stranger and nothing bad happened. It wasn't even uncomfortable except for the part where I decided to say hello. If the thought of conversing with a stranger terrifies you like it usually does me, you should still give it a try sometime. You probably won't even have to say much. People love talking about themselves and telling their stories. All you have to do is listen and ask a question or two. My friend Dan is a master at this. He's so good at it that I usually find myself halfway through the conversation thinking, "I am talking way too much. Uh, quick! Come up with something to ask!" and then I end up sort of stumbling back through whatever question he last asked me, trying to get him to answer it too. I'm getting better at it, I guess. ¹Highly recommended, by the way. Excellent selection and even better customer service... and their prices are reasonable! ²For me, anyway. As you may have inferred, I don't really do this kind of thing a lot. ³Imagine a doctor saying "Let's take a look" in that kind of soothing, reassuring way as he lifts a stethoscope to his ears. Scott posted that quote up there on Facebook yesterday and it got me thinking about how things have changed since I was younger, and specifically about how it's easier to be introverted now. I wrote a post about that yesterday, and about a couple of moments in my life where I've chosen to be a little bit extraverted for a particular reason. Last weekend my family and two other families to whom Caitlin is related went on a vacation to Michigan's splendid Upper Peninsula. (Her dad and youngest brother also came along. She is related to them too.) By the time we made it into the U.P. from Wisconsin, my cell phone had lost service and wouldn't regain it until we drove from the U.P. to the Mitten across the Mackinac Bridge.³ As a result, one of my primary methods of avoiding human contact was rendered inert. On our way home, a strange thing happened. I approached pairs of strangers on two separate occasions to ask if they would like me to take their photo. I don't know if it was my good mood, all the practice not looking at my phone, my general desire to be helpful, or memories of gratitude when a stranger offered to take our photo (twice! Once on our honeymoon in Tennessee, and once on a family trip to Houston, TX), but at any rate here I was, walking up to one half of a couple taking the other half's photo, walking up to a person awkwardly holding her arm out to get a two-person selfie, and essentially saying "hey, I would like to be part of your life for a moment." It went well. They seemed happy, I felt helpful, and nobody gave me a sideways look. Maybe it helped that, should they think me weird, I knew I'd probably never see them again. Anyway, it was fine. You should try it sometime. ¹Somebody should make a children's book about psychology called I is for Introvert. It could have intricate coloring pages in the back that take hours to complete. ³The astute reader will note that our outbound and inbound routes differed. Indeed, we circumnavigated Lake Michigan. Hurrah! I am not particularly outgoing by nature, and technology has generally removed any need I might otherwise have had for talking to other people except as it pertains to my job or my family. A song from Sesame Street suggests that there are in fact people in my neighborhood, people that I meet each day, but I have found that this need not be the case. Who might I meet each day? A bank teller? Nope, online banking. A checkout clerk? Nope, the self-checkout lane. A gas station attendant? Nope, pay at the pump. Asking somebody the time? Nope, my cell phone. Small talk in a waiting room? Nope, my cell phone. Directions when I'm out of town? Nope, my cell phone. Friendly strangers while I'm out for a walk? Nope, their cell phone (and earbuds). Whew. At certain points in my life I have made a conscious effort to engage others in conversation where normally I would remain silent. Actually, the first example that comes to mind is not so much about engaging in conversation as it is about opening myself up to conversation, which can be just as terrifying. When I left my high school and the classmates I had studied with for 13 years, I went to Bethel College, where I was surrounded by hundreds and hundreds of strangers and barely knew anyone else. I decided that I would probably have a better experience if I met some people, and that probably most other people were not just going to come up and start talking to me. For these reasons I decided to say "Hi" to everyone I met on the sidewalks of Bethel's campus who wasn't already having a conversation. No "how are you" because I hate that most people don't want an answer (or don't give an answer), and no "Hi, my name is Peter" because that's weird and creepy. Just "Hi." A lot of people said "Hi" back, and though I don't remember it leading to any particular conversations, it made me feel a lot less closed off than I would have felt sticking to my nature and silently walking (or rolling) down the sidewalk. I'm sure it allowed me to participate in later conversations that I would have otherwise not been part of, either because I recognized a person from having said "Hi" to them or maybe because they recognized me. The second example I can think of is a few months ago when I was shopping at Meijer by myself. As I passed by the aisle with the snack crackers I saw a man put a box of orange cheese-flavored things in his and his wife's cart, and she said, "oh wait, do we want Cheese Nips or Cheez-its?" This struck me as a perfect example of the mundane conversations we all have all the time - things that really don't matter in the grand scheme of things yet they're still really important to us on a small scale - and I thought it was hilarious and awesome. The inside of me smiled when I felt a weird urge to ask them which they decided on. This is not me. But, I thought, if it made me smile then maybe it would make them smile too. Or maybe they would just think I was weird. Whether I like it or not, I care a lot about what strangers think of me. On the other hand, there's a good chance I'll never see them again. In the end, my curiosity overpowered my shyness and I turned the cart around and felt myself walking back an aisle to where the cracker discussion had taken place. I don't remember exactly how it played out, but I said something like, "Sorry, but I overheard the earth-shattering discussion happening and now I just have to know: Did you go with Cheese Nips or Cheez-its?" It was at this moment that I suddenly realized what was happening. I had just strolled into a stranger's life and asked them a very personal question about what kind of snack crackers they preferred. What was I doing? This is embarrassing and weird! Wait, I think they're laughing. Oh good, at least it was ha-ha weird and not call-the-police weird. It only took about half a second to think all of that so I just kept going. I peeked into their cart and observed, "ah, Cheese Nips, huh? Good choice. Well, have a nice night!" Freed from the situation I had put myself in I wheeled the cart around and walked, maybe a little faster than usual, back toward the front of the store past the tank full of lobsters who thankfully were unable to point and laugh at my fit of social ineptitude. Still, it made me feel good to share my observation with someone else and it felt good that they thought it was funny too. I walked toward the self-checkout with a goofy smile on my face. If we truly believe that God loves us, our reciprocation should be not only to Him but also to our fellow man¹. If we do not have love for the humans around us who have been made in God's image (hint: this is everybody), then we do not have love for God. Our love for others should be a reflection of God's love for us, and He loves us unconditionally. And this commandment we have from [God]: whoever loves God must also love his brother. There are all kinds of current events this could be applied to, but I don't really want to get on a soapbox, so I'm going to leave it at that. God loves all of us more profoundly and more deeply than we can possibly comprehend, and our response should be one of praise, gratitude, and a love for God so boundless that it spills over into unmitigated love for one another. ¹yes, as in 'mankind.' Yes, that includes all of humanity. You know what I meant, no need to fuss about it. These are pieces of 3/4" red-oak-faced plywood which I had cut (a little too long, as it turned out) and stained nearly a year ago. They sat nicely on the cleats and were pretty stable once I installed some small L-brackets to hold them in place, but there was still a notable amount of flex near the middle of the shelves. While they probably would have been okay, I didn't want them to sag over time, so I attached a piece of 1x2 pine to the bottom of the shelves at the front as shown in the photo above. To prevent splitting, I pre-drilled about 10 holes per board (just under an 8' span) and then screwed this reinforcement piece to the shelf above it. This added a lot of rigidity. The final step was to add a face piece to the edge of the shelves in order to clean up the look a little bit. I went back and forth on several options but ended up going with strips of PVC lattice, a little over 1-1/2" wide and around 1/8" thick. I attached them to the shelves using J-B Weld ClearWeld Epoxy. I wasn't sure how well that would turn out but it went much better than I would have guessed. The plastic below is to catch any drips from the epoxy, but that turned out to be a non-issue. ¹okay, fine: mostly complete. That space up above the closet needs to have the sliding doors painted and reinstalled. However, they don't prevent me from using the shelves below which means I can get this office back in order! Excitement abounds. If you happened to follow the rävenfoto blog when it existed, you may recall a post about remodeling one of the bedrooms in my house into an office. It was a fairly big job; we repainted the walls from a weird green to a dark gray, repainted the ceiling and trim from off-white to bright white, pulled up the carpet and refinished the red oak flooring underneath, added several outlets and four network jacks, and replaced the lighting fixture with track lighting that runs all the way around the room. When all of the above was completed, the remodel was probably 90% complete, and I began using the room as my office... at which point nearly all progress on the remodel ceased. A few things got done afterward - we replaced the folding wooden shutter doors on the odd over-the-stairs closet with an aesthetically clean white piece of wood; I finally installed shades on the windows - but one task loitered in the corner, looming over me, leering at me. It was a gaping hole (two, actually) in the otherwise-quite-nice-looking room. It was: THE CLOSET. In the process of refinishing the oak floor, I removed the folding doors which had previously spanned the now-gaping maw of the formidable closet. I decided that an open-front closet would make the room feel a bit bigger, and that having the interior painted bright white would bring a little more light into a room with dark gray walls. Sounds pretty great, right? *pats self on back* The only problem is that I then proceeded to use the closet, in its dreadful state, to hold stuff. Gentle reader, I will let you in on something. Stuff does not like to move. In fact, Newton's first law of motion confirms to us that once you put stuff somewhere, said stuff will stay right there unless somebody¹ does something about it. So you see, the stuff was not taunting me, nor tormenting, nor purposefully blocking my progress on the closet project. It was instead dutifully following the laws of the universe, just waiting for some action on my part to overcome my default state of inaction, to move that stuff out of the way and to keep the project rolling. I found it much easier to just blame the stuff. I did make some baby steps² - by last year sometime, I managed to get some nice 3/4" oak plywood to use for long shelves in the closet (I even cut it to size and stained it), and had removed the ugly/boring wire rack from the closet. Other than that, though, not much changed. Eventually, however, I did make a little progress by getting that stuff out of the closet. As a result, some of that stuff ended up in the main area of my office, where it was (is) in the way all the time. I knocked out the old shelves, and in order to get that stuff back in the closet where it would be out of my way and where I could access it easily, I have to get some shelves back in place. I ran four more network cables, for reasons.³ I finally got that stupid hole patched up. I finally have some new baseboard to go across the back of the closet. I finally got some cleats attached to the wall to help support the new shelves. It finally feels like this thing might get finished soon, after all. A day or two ago, I sat in the closet doing some work but lamenting how long it was all taking - it seemed like as I got closer to the end there were more and more things to do to get it done right. It seemed like I wasn't making progress but there I was, sitting in the closet, doing work. My perspective at that moment was one of defeat, of frustration at the "one more thing" that needed to be done. Instead, I should have realized that showing up to do the work is a win in itself. It's like I forgot for a moment that I have this blog to help me do things by way of sharing them with the internet. The white cleats previously held shelves that went the short way across the closet. All that's really left is to put a bit more trim at the baseboard, paint everything (except the floor - note the [plastic] dropcloth! ), and then install the shelves (which still need to be trimmed down by about a half inch, because apparently I can't measure). I guess at that point I'll still need to install the faceplate for the network jacks and swap out the receptacle for a newer style one to match the rest of the office. Okay, so that list got a little longer than I expected, but still - progress! Real progress too, not the kind where you think you're getting stuff done but really you're just staying busy for the sake of busyness. ANYWAY, thanks as always for joining me as I attempt to do stuff and then share it with the internet. I really appreciate your company. ¹ I'm using the term "somebody" fairly liberally here, perhaps more accurately rendered "some body" because really all it takes is an unbalanced force to move the stuff, which could come in the form of a celestial body straying too close to Earth and drawing the stuff in by its gravity (though at that point we've got bigger fish to fry), or by a body of water forming in my office and causing the stuff to float away (though again, bigger fish), or by shifting tectonic plates causing an earthquake that dislodges the stuff from its happy nook (at which point the closet would remodel itself as well, though perhaps not in the fashion desired). The point is, the stuff is unlikely to move unless a person moves it, and I'm the only one who's likely to do that, especially now that Caitlin is pregnant and is not supposed to move stuff. Doctor's orders, you know. ² The term "Baby Steps" is kind of a misnomer unto itself - I mean, what baby can actually take steps? I guess you could classify crawling as step-taking, though that's really a stretch. By the time a baby takes said steps, it is well into the territory of "toddling" at which point the child is by definition a toddler. Get with it, idiom! I did just consider the fact that the "baby" in "baby steps" could itself be a metaphor, referring to the diminutive size of the proverbial steps. On behalf of grumpy linguists everywhere I would like to formally apologize to both the idiom and its mother. ³ Reasons! First of all I just enjoy running network cable to places where it may be needed. In this case I ran four of them because I planned to use two for my wireless access point/router (one coming in from the modem and one heading back down to my 16-port switch), and one for my networked printer. "But wait!" cries the astute reader, "Two plus one equals three! This is a different number from four!" If the astute reader is you, you are correct. It just seemed better to put in four because it's a lot easier to find a four-port keystone plate, and because I've got a 24-port patch panel so why not? It was after wiring up these four ports that I sheepishly realized that my networked printer contains only a wireless adapter, having no ethernet port. Ah, well... reasons. I'm sure I'll find a use for the extra ports sometime. This past weekend was a busy one. On Friday I shot video at a wedding and reception in Portage and Valparaiso, respectively (thanks to Joe for his assistance! ); on Saturday I shot video at the recital we held for our music students; on Sunday I got to play along with our worship band after church (I'll be playing occasionally starting soon). The weekend rolled on into Monday when I shot a promotional video for the EZ-Trieve Pen, a product for which I am helping with marketing and launch strategy. (Thanks to Will for his assistance!) After that wrapped up we had a couple of hours before our next thing so we went to Notre Dame and wandered around filming things. This was much fun to shoot and refreshing to edit. Next up will be the recital video because I can knock it out quickly and then the wedding video because I promised a 2-week turnaround time. The EZ-Trieve pen will require another day of shooting further down the road before I have everything I need so it will be on hold for a bit as soon as I get some preliminary work done first. When the recital and wedding videos are complete my next project will be to finish the logo and website for my friend Chelsea, who is an editor (of words, not videos) and you should hire her if you need any words edited. Clearly I could use some help in this area but this is just a silly blog so I think we'll be okay. If you have anything that matters, though - a book, say, or a dissertation, or even a resume/cover letter - you should definitely email Chelsea@SafeHarborEditing.com and she can help you out. Well there we have it. It looks like this blog achieved its stated goal once again, because I made a thing and shared it with the internet. Thanks for being here! Last Monday evening, my daughter got sick. Then my wife got sick. Then I got sick. It was dreadful. Thankfully, my son managed not to show any signs of illness, though he had been sick the previous week so maybe he's the one that handed it off to the rest of us. At any rate, today is the first day I've felt mostly normal in just over a week (though it feels like it was two weeks) so that's why you haven't seen any updates from me in a while. This time around I decided to try my hand at producing a rap-oriented track. I've had this little hook rolling around in my head for months, and now that I've gotten a handle on the basics of Audiotool it proved to be a good way to put some bones on the idea and see how it moved. That was a weird metaphor. Anyway, here it is - I'd love to hear any feedback you might have! Yesterday I talked about Audiotool (a ridiculously cool website for making music) and shared my first Auditool creation, imaginatively titled "Experiment #1". Today I'd like to share my second Audiotool creation, given the increasingly clever moniker "Experiment #2". I'd love to hear your feedback on these first two tracks, whether it's here on the blog, on Facebook, or on SoundCloud! I'm having a lot of fun playing with this website and I'm excited to keep learning with it. Recently, my brother Matt introduced me to a website called Audiotool.com - it's a web app that facilitates music creation and it includes several virtual instruments, a mixer, a multitrack sequencer/editor, and the ability to import your own sounds or samples. Here's the layout of instruments for my completed song, if you can call it that. I played with it for a few minutes the night he showed it to me, and then yesterday I played with it for a few hours. I didn't get super deep into the features available with Audiotool, but it's pretty intuitive and I was able to play with several of the included modules. None of the modules are directly named what they've been designed after, because of course the names are copyrighted. That said, I used a TR-808 and TR-909 (both Roland drum machines), a TB-303 (bass sequencer), and a 3-oscillator synth that seems a lot like a Minimoog. I also used a couple of reverb pedals, a distortion pedal, and two somethings. In Audiotool it's called a Tonematrix but I'm not sure the real-life thing it's modeled on, though it looks more or less like a Novation Launchpad, but with 16x16 buttons. The virtual instrument acts as a sequencer though it can also output its own notes as well which sound a bit like a marimba. Anyway, here's what I came up with. I hope you enjoy it! In case you missed it on Friday, episode 3 of Let's Play Friday is now live! 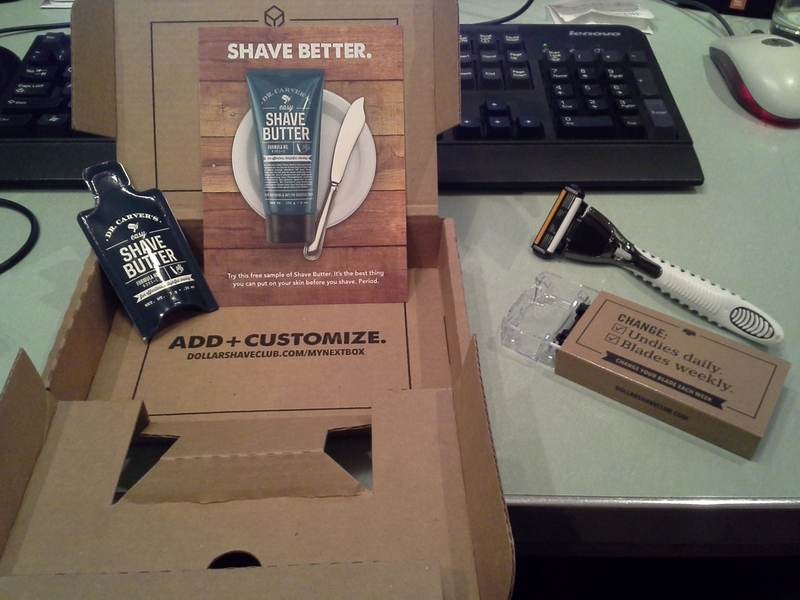 I recently decided to finally try out Dollar Shave Club after first hearing about it several years ago. I don't usually shave that often, but after letting my Novembeard grow all the way through the end of March I decided to go clean-shaven for a while. I'm looking forward to trying the Shave Butter but since it had been so long since my face felt the shave of a razor (probably close to a year) I opted for the shaving gel and aftershave lotion that I had used before. I held a hot washcloth to my face for 30 seconds or so, bathed my whiskers in shave gel, and said goodbye. It wasn't so bad. I will say that the Gillette FlexBall does provide a better shave than the DSC blade, but at a much higher cost. I was lucky enough to get the FlexBall for free a while back as part of a promotional giveaway, otherwise I think it's unlikely that I would have tried it out. I paid for the Dollar Shave Club blades with my own dollars, but if you try it out through my links to their site, I do get a $5 credit for the referral. Well there it is. Shout out to my cousin Joel via the shirt. I've added a new section to this website titled "Buy My Things," which ought to be straightforward enough for you to figure out. I have too much stuff, so I am selling some of it. Right now everything I have listed is new or used skate gear, but I expect to have miscellaneous other stuff up there sooner or later. This section was set up using the Commerce features built into Squarespace, which was pretty easy to configure, but there are two things I don't like about it. 1) Payment processing is required to go through Stripe. I'd much rather just use PayPal, but whatever. 2) Shipping charges are either really smart or really dumb, and I'd like something that falls somewhere in the middle. For example, you can either have it calculate shipping based on total weight of everything (which requires me to know the weights of the things I'm selling) or it can charge a flat rate per order plus an optional flat fee per item. If I were selling a bunch of stuff that was all roughly the same size and weight this might make sense, but since I've got everything from skate wheels to complete skateboards listed up there right now, it doesn't really fit. Using that second method may end up way overcharging people who just buy a set of wheels, or way undercharging people who buy three skate decks. It also doesn't allow for local pickup, though you could set that as an secondary shipping option I guess. Actually, I'm going to add that right now. Okay, so now people can choose "local pickup" if they're going to get the stuff from me directly. The other option, which I was getting to before I got distracted, is labeled "BILL SHIPPING SEPARATELY," which pretty much does as it says on the tin. With this option I'll go ahead and ship the items, send the customer an email with the exact shipping fees I paid, and hope they reimburse me via PayPal or something. If I were running a business I wouldn't really trust people to do that, but since my main goal is to get rid of stuff I figure it's worth the risk of losing out on a few bucks in order to cut down on the junk in my house. Two bits of exciting news regarding Let's Play Friday! 1: I now have a custom channel name on YouTube! You can find me at http://youtube.com/c/LetsPlayFriday instead of the big string of random characters I was previously assigned. Yesterday I described some of the things that have been keeping me busy and away from the blog for the past month or so. ...specifically starting around October of this year. See, that's my sweater on the far left; Caitlin's is next to it, then Elias', then Amelia's, and then... what's that? I'm chuffed to bits to share that the four of us will be welcoming a fifth family member this fall! It's been a while since I posted here, and that has been for one very good and one very bad reason. The good reason: When I wasn't sick, I was doing a lot of stuff! I got a new computer put together, I published the first episode of Let's Play Friday and hosted a launch party for it, I've been working on branding and promotion for a new product a client is bringing to market and doing the same for a friend who's launching her business, I got my office decluttered and rearranged, I got an Arturia Minibrute SE analog synthesizer (tons of fun! ), and lots of other stuff too! So, I haven't had a lot of time to post here, but I would like for that to change. Anyway, I hope to be posting more here soon and hope that you'll join me in my adventures! I'm planning another video to document the process of setting up my current (soon to be "old") video editing PC to record video directly from the Atari 2600 and other game systems. Let me know if you found this useful, interesting, etc. Also let me know if there's something you want to see, something I could have done better, or any other suggestions! As I prepare to launch Let's Play Friday, there's a lot of behind-the-scenes stuff to get set up before I record the first show. In my last status update I discussed the webcam I'll be using to record myself as well as the capture card I'll be using to record the gameplay. Another major part of the production process is having a place to store and archive all the raw video as well as the finished products. I do my editing on a desktop computer so it's fairly simple to stick an extra hard drive in there when I run out of space, but a solution I've been wanting to implement for a couple of years now is Network Attached Storage, or NAS. Essentially, this is a box full of hard drives that sits on the network, making it easy to access your data from any connected device (and potentially including access across the internet, similar to Dropbox). I recently purchased a Synology DS415+ 4-bay NAS enclosure, along with two Western Digital 4TB RED drives designed for NAS use. Last night I got everything put together and set up on my home network; it was a shockingly easy and quick setup process. I also recorded a video of the whole process which I'll be editing together over the next couple of days and will post up for anyone who's interested. Coming up after that will be a video showing the install/configuration of my Hauppauge TV Tuner card to capture incoming video and audio from my old gaming systems, along with a build video for my new editing PC, which I'm super excited about. I've been skateboarding about as long as I've been walking. My older brothers (7 and 8.5 years older than me) got me into it because it's what they did. As a kid, skateboarding was just another way to get around and have fun outside, same as a bike or scooter (and I don't mean razor scooters; we had one with 8" inflatable tires we could ride through the yard!). It never seemed unusual to me to skateboard; it never had that outsider status to me because it's just what I did and what my brothers taught me. And yet, there was nobody else I knew of who skateboarded while I was growing up. I was riding in a vacuum, but because my brothers skated sometimes and because I constantly watched the McGee and Me video "Skate Expectations," I never really noticed the lack of community. Don't be fooled into thinking that I'm actually talented as a skateboarder just because I've been doing it so long. I'm not. While other things certainly play into it, I think a big contributing factor to my lack of talent is the lack of community described above. Without other people to skate with, it can be hard to progress. There's nobody to push you forward, nobody whose tricks you can build off of, and nobody to benchmark against. There's a lot more to my skateboarding story moving into high school and especially my college years, but I think we'll stop here for now because I want to spend a little more time on the importance of community in skateboarding. Being a skateboarder: I think it starts with a sense of community; something that we seek - I think all of us as skaters feel a little bit like outsiders. I certainly did, and a lot of my friends feel that way too. And so, in an effort to both be an outsider - that inner sense of not belonging - and yet with a deep yearning for belonging (which I think all human beings have) - how can you do that, how can you find a sense of community? In this sort of multidimensional platform that we have with skateboarding, that we can create on our own terms with never-ending (and I think it’s safe to say never-ending) possibilities. And even atop the possibilities each one has a style through which we can define ourselves through what we do and a voice that we have that’s specific to us. The more we individuate ourselves and separate ourselves, the more we get a sense of belonging, because that’s what the community itself seeks - is to be separate and yet belong. So the more we individuate ourselves through what we do, the more we are embraced by the community around us, and we leverage what the community gives us (that is, the tricks; that is, the ethos imbued through the arts) and when we give that back we are recognized by our peers and that only brings it up higher, and all of this together creates that synergy that really is skateboarding. In this, Mullen sums up the core dichotomy of skateboarding: it is by culture's definition an outsider's sport, yet we all as humans feel a deep need for a sense of belonging. Skateboarding serves both needs - the need for individual differentiation and the need for community acceptance - and in fact these two factors work together to advance the sport. As new tricks are conceived and new innovations are realized, they are fed back into the community and expand the palette shared by all skateboarders. At its best skateboarding is about a group of individuals pushing the boundaries of the sport, each in their own way, in order to constantly redefine and elevate what it means to ride a skateboard. If you enjoyed this post, please leave a comment! Your comments help me decide what to write about and help me get better at this blogging thing.